With a statewide appellate practice, Neil Rose is an appellate lawyer in his fourth decade of practice. Board Certified by the Florida Bar in Appellate Practice (four times) since 1994, he has handled hundreds of appellate matters and has over 140 published appellate decisions to his credit. From 1980-1994, he was Designated by the Florida Bar as a Specialist in Appellate Practice. He has handled appeals in all five district courts of appeal and in the Supreme Court of Florida, as well as in the Eleventh Circuit Court of Appeals. Neil was appointed by the President of the Florida Bar as a member of the Appellate Rules Committee of the Florida Bar, 1989-1992 & 2004-2010. He is a Charter Member of the Appellate Practice and Advocacy Section of the Florida Bar. He is also a published author on the law. Neil has been selected by Super Lawyers Magazine as one of the top lawyers in appellate practice for seven consecutive years. 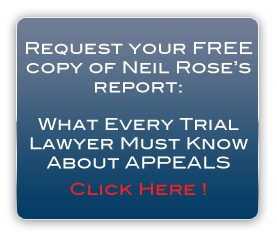 Neil Rose devotes his practice exclusively to appellate litigation and complex trial-level motions, assisting trial lawyers in court and handling referrals from attorneys and their clients throughout the state of Florida. Neil is the "best friend" of the trial lawyer, counseling trial lawyers on the creation and protection of an appellate record. He handles appellate litigation, including working with trial counsel to identify the issues on appeal, designating the record on appeal, prosecuting and defending appellate motions, researching and drafting appellate briefs and presenting oral arguments. Neil Rose is available for referrals, consultations, and/or co-counsel arrangement, depending on the needs of the trial attorney and client. Neil also offers expert testimony on attorney's fees or other appellate issues. Fees are on a case-by-case basis and can be on a contingency, hourly, or flat fee basis. No matter what the case, Neil is committed to effective advocacy throughout the trial and appellate court system, whether it's researching the law, writing a memo or legal brief, or presenting legal argument to the court. The hiring of an attorney is an important decision that should not be based solely upon advertisements. Before you decide, you may ask the attorney to send you free written information about the attorney's qualifications and experience. This information may be available online.